Written by: KristaG on February 5, 2019. Today, February 5, 2019, is the first day of the 15-day-long Chinese New Year celebration. Festivities are held all over the world as people observe the Lunar New Year. 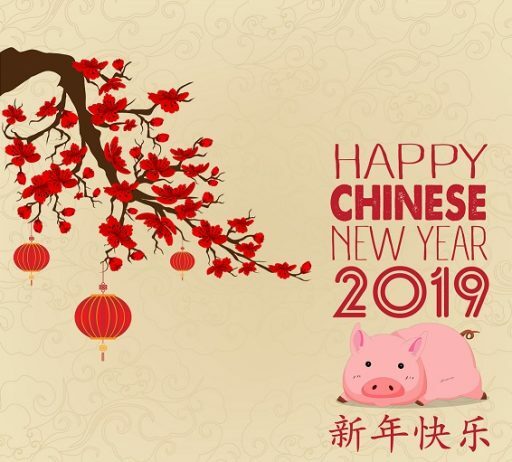 According to the Chinese lunisolar calendar, this is the beginning of year 4717 and, as it is the Year of the Boar/Pig, should be full of luck, wealth, and overall good fortune. I, myself, celebrate every year by distributing Hongbao (a.k.a. Lucky Red Envelopes), cooking a traditional Chinese meal or two, attempting to attend at least one Lion Dance performance and, of course, hosting a game night! This year, my friends and I are ushering in the Year of the Boar/Pig with a game of Crossroads of Heroes from Pat Piper! Crossroads of Heroes is a 2-4 player adventure boardgame that first appeared on Kickstarter in February of 2017. The self-published game is full of artwork reminiscent of traditional wuxia style art and almost all of it was created by Pat Piper (a.k.a. Patrick Lee) himself! The Chinese calligraphy, though, was provided by Jan Wong Lee. What is wuxia, you ask? Other than the theme of the game, wuxia is a type of genre in Chinese literature that tells a tale of martial arts fantasy. One of my favorite film examples of the genre is Ang Lee’s Crouching Tiger, Hidden Dragon. Crossroads of Heroes portrays this through the telling of a story surrounding heroes from 5 different sects (6, if you include the expansion) and their journeys through the Jianghu (similar in concept to “the dangerous unknown” or “wilderness”) to become the next Grand Master of Wulin. 2-player example board set up. For players to begin their journeys, they must first decide which of the 5 sects (Emei, Shaolin, Beggar, Wudang, and Kunlun) they want to represent. Each sect has its own unique playstyle and philosophy, so it is something to consider when choosing a character. Once chosen, each player will take the corresponding Character Card, a reference card, 6 Qi tokens, and that character’s “suite” of components as described in the rules. The game board represents the Jianghu and should be placed in the center of the play area. While traversing the Jianghu, players will encounter various characters and events. Fortunately, all of these possibilities are organized on the board itself. The 5 Sect Guardians are shuffled and placed face up in the spaces across the top of the board while the 5 Free Exploration cards are shuffled and placed face down in the spaces across the bottom. A Reward deck is placed face down on the left side of the board by the Renown Chart but remains unshuffled. The Strategem and Item decks are shuffled and placed off to the side of the board. A card is drawn from each of these decks to start their respective discard piles. Each character standee is placed in its own lane on the “Journey Start” column of the Renown Chart, ready to make their move to advance through the Jianghu. Lastly, Yexun Yibai’s character token is placed on the Adventurer icon on the Renown Chart while the 5 Wulin Masters and any remaining tokens are set aside for later use. Once all of this has been completed and the first player has been determined (either the Jing Lian player representing the Emei Sect or at random), the journey is ready to begin! All players have the chance to become Evil Scum. Not only does their victory condition change, but they lose access to their Sect Guardian and change their entire appearance! Before the game begins, each player is given 3 Strategem cards face down to form their starting hand (if Xiao Jingtian of the Kunlun Sect is in the game, that player will receive 5 Strategem cards due to his special ability). The last player is permitted to redraw up to 2 cards and the second-to-last player is allowed to redraw 1. Starting with the first player, the game is played over multiple rounds consisting of individual turns. On a player’s turn, they must take the following 5 actions (if applicable) in order: Draw Action, Complete Training, Card Action, Main Action, and End Action. While this may seem intimidating at first, these actions are simple to understand and actually quick to perform. During the Draw Action, a player will draw 1 card from both the Item and the Strategem decks, but they can only keep 1; the other is discarded. Complete Training is only applicable if a player chose to Train a Technique in the previous turn during their Main Action, but is performed by paying the Qi cost and collecting the card. During the Card Action phase, a player may play any number of Strategem or Item cards from their hand. However, identical Strategems cannot be played during the same turn. Some of these Strategems include things like Poison Smoke, Forgiveness, or Training Mishap. Certain Strategems will also cause players to accumulate Xie tokens. Too many of these will lead the character down a darker path and will even change a character’s win condition as they are consumed by evil. Players can find a wide range of helpful items along their journey including food, medicine, and weapons. Unless a player is paralyzed, they then get to choose to either Train A Technique, Duel With A Player or Travel the Jianghu as their Main Action. Training a Technique is simple, but takes 2 rounds. It is also important to remember that techniques must be trained in order of level, beginning with Level 1. When dueling another player, there are 3 rounds of combat with the winner being determined as the best of 3 rounds. Though the specifics for how to duel are included in the rule book, it is important to note that winning duels is one of the ways to earn Renown and move further ahead on the Renown chart, but losing duel rounds and duels will cause a loss of Qi tokens (Qi is used similarly to currency in the game) as well as causing the victor to become the loser’s Nemesis. Should players reach a draw during a duel, nothing happens except it counting towards 1 of the 3 combat rounds. A player may also choose to admit defeat if they do not wish to fight so long as they are not currently in possession of the title of Grand Master and/or their opponent is a virtuous player and not one that has succumbed to their evil deeds. Admitting defeat will cost a player 1 Renown on the Renown chart. Should a player choose to Travel the Jianghu as their Main Action, they are also met with some choices. 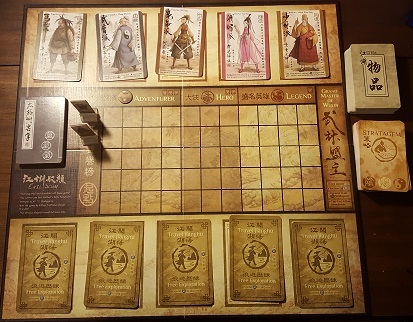 A player may either visit a personality at the top of the board (either a Sect Guardian or a Wulin Master depending on what stage of the game you’re in) or encounter one of the 5 Free Exploration cards at the bottom of the board. A player’s End Action is mostly a cleanup action. Players check to see if they are poisoned (if yes, they lose 1 Qi), make sure they have no more than 7 Strategem cards in their hand, and make sure they have no more than 3 Item cards. Once all of these actions are completed, play moves to the player on the left until one of the victory conditions has been met: either a virtuous player attains the title of Grand Master of Wulin and doesn’t have the title taken from them in the final round, a player who has gone down the Evil Path is successful in killing a virtuous player, or, should all players have turned evil, all other players have been wiped out and the survivor is the winner of the game. As mentioned above, there is currently only 1 expansion available for Crossroads of Heroes: the Evil Sect! 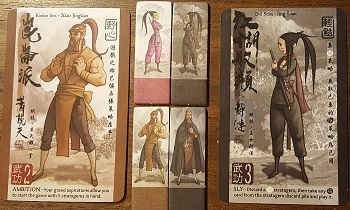 The expansion does come in its own box and includes a new character (Gu Lenghu), his character “suite,” a reference sheet, and instructions for how to incorporate Gu Lenghu into the base game. By including the Evil Sect in a game, it allows for a player to start the story off as an already evil character intent on corrupting or killing other players. As there is no Sect Guardian for evil players, Gu Lenghu comes with a Henchman to aid him in duels instead! 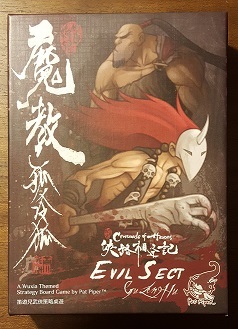 Though playable in a 2-player game, it is really recommended that the Evil Sect expansion is used in games of 3 or more to preserve the balance of the game. Personally, I would love to see more additions to the game like this. Even if there aren’t more sects added, perhaps new hero choices in the already established sects? I feel there is a lot of room here to play with the idea of more expansions! Though the Kickstarter campaign for Crossroads of Heroes was successful, there were only 664 backers (of which I was one) and I feel that those who canceled their pledges or missed the campaign seriously missed out on an amazing game! 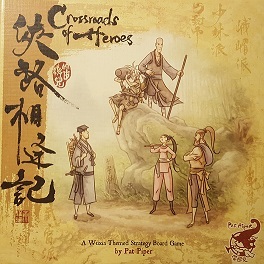 In fact, I tend to include Crossroads of Heroes as one of my top games that I consider to be a “hidden gem.” I’ve had the game for about a year now and I have to say it still gets a lot of love and its theme makes it perfect for anyone who is wanting to celebrate the Lunar New Year, has a love of the wuxia or xiaxia genres of literature, or is a Kung Fu practitioner like myself. Crossroads of Heroes is not a game for the faint of heart, however. There is a lot of strategy involved, some serious decision making, and a little bit of a learning curve for the first game or two, but once you get it down, I feel one really does get the sense of watching a story unfold before them that tells both the spiritual and martial journeys of their characters traversing the Jianghu. Gong Xi Fa Cai and Happy Year of the Pig!